Magnetic levitation (maglev) stages have been the subject of research and development projects since the 1980s, with the aim of creating free-floating high-precision positioning stage. We introduced a maglev stage using an inverted planar motor in 2006. Now this is a proven technology that works reliably. Using magnetic levitation with an inverted planar motor makes free-floating movement possible. The mover can meet challenging requirements and can work under extreme conditions. Unique to this mover is its capacity to rotate around its own Z-axis, making full 360° circles. 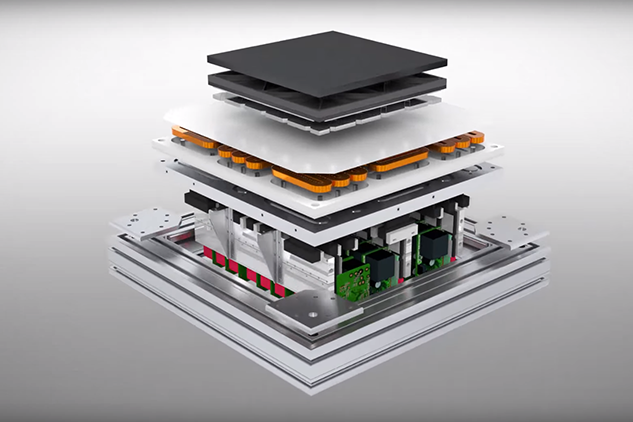 The animation video shows the possibilities of a maglev stage combined with an inverted planar motor. This technology is called ‘inverted’ because its coils and magnets are inverted compared to conventional maglev stages. The magnets are in the free-floating mover, and the coils are in the stationary tiles. The benefit of this inverted use of coils and magnets is that moving power cables, cooling, and bearings are not needed in the free-floating mover. Inverting the magnets and coils results in an easy-to-clean wireless mover with no wear of parts. The mover can be encapsulated in a closed box. This makes the mover more suitable for harsh environments (e.g. radioactive materials, biohazardous or infectious materials, toxic or infectious substances, dangerous or harmful irritants). Is it magic or maglev? Seeing these free-floating movers is a bit like watching a magic show. However, the maglev stage is mechanically simple. So no magic there. Where the magic happens, is in the innovative applications: Where do your use it? What materials are used to coat the mover? What form does the mover have? Are wireless data or energy transfer used on the mover? Initial applications were optical and e-beam lithography and inspection, extreme ultra-violet (EUV) lithography, and nano-imprint lithography. Now the technology has been applied in industries including laser machining, materials research, pharmaceutics, medical, inspection, chemical, and food production industries. Ultra-high vacuum (UHV) requirements, ultra-low contamination (ULC) applications and other unconventional requirements have been the breeding ground for developing these maglev stages. The tiles can be curved, vertical or even upside down. The movers can float or glide. Recent developments have made it possible to let the floating mover rotate around its own Z-axis, making full 360° circles. This means that at Philips Innovation Services, we have added rotary stage features to our maglev stage competencies. The stage has (in theory) infinite ranges in the plane, only depending on the number of tiles. All our maglev stages are custom products, a one-off. For the demonstrators and prototypes, development software standards (such as Matlab and Labview) make it work. For use within a production environment, the custom made maglev stages may be connected to industrial hardware and software standards. The inverted maglev stage is simple from a mechanical viewpoint, and making a mover hover is relatively easy. The challenge lies in making it move with high accuracy. That typically involves a sensor principle that complies with the application. So for example, the ability to measure full rotations, or to withstand the harsh environment. In addition, challenges to be dealt with are developing calibration strategies, modularity concepts, and advanced motion software to achieve the desired accuracies. We are always on the lookout for new challenges and ways to accelerate innovations. Do you have a maglev stage challenge for us? Do you feel the need for innovating your rotary stage, xyz stage, xy table, linear motor, bearing based positioning stage, conveyer belt or traditional high-precision system? Do you want your own piece of the maglev-magic? Then let us make it work for you. What do you want to know about this maglev technology based planar motor? Are you curious about this inverted planar motor with maglev technology? Are you interested in learning more about the design and manufacturing of a rotary stage with free-floating movers? Are you on the lookout for the newest technologies in town? Our mechatronics experts are here to think along with you and to accelerate your innovation with clever new technology designs. We have been working on magnetic floating positioning stages for over 30 years now, and we are ready to share our knowledge with you. Get up-to-date on maglev stages with inverted planar motor technology and contact our expert now. Looking for high-precision engineering expertise?